Bowleaze Cove car boot is one of the rare few that takes place on a Monday, and not just Bank Holiday Mondays. (And there is at least one nearby-ish on a Tuesday as well – see following post.) So when the chance came for me to spend a couple of days in Dorset and the forecast was fine (for the mornings anyway), I decided to have a working holiday. “Bowleaze Cove” sounded a bit vague so I was relieved the sat nav recognised “Beachside Leisure Centre”. Also, the car boot was well signposted. As a former townie, I always used to assume that the sat nav would get you anywhere just by the postcode: not necessarily so out in the countryside! Another slight nagging worry was that the website said “Sellers arrive from 6am”. Now, whatever a car boot website tells you is the sellers’ arrival time, you can bet your bottom dollar that it will begin (even) earlier than that! I hadn’t left until 5.20 and it was a good 2 1/2 hours’ drive – would I be too late? I needn’t have worried. Despite arriving at 7.40, I was not the last. Car boots tend to be friendly places and the welcome and the banter started as soon as I arrived. The organiser was not at all put out when I pointed out, in response to his “I’ve got just the spot for a little car like yours” that actually my little car was a bit of a Tardis and I had a lot of stuff on board and he directed me to a more spacious spot, in front of a guy with little more than a table’s worth of stock. 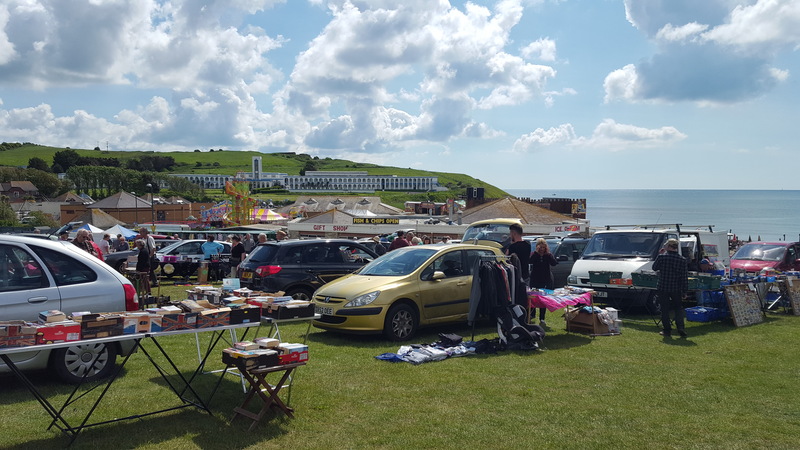 As there is a market as well as a car boot, the website warns that booters are restricted to second hand goods only and that stalls offering all new goods would attract market trader rates. Fair enough. As well as my vintage haberdashery – knitting needles, buttons, sewing cottons – I’d brought along old crafting books and magazines, clothes and so on. To be honest, trade did seem a little slow most of the time. Usually, I do prefer a busier venue but with views like these on a sunny morning (albeit with one dark, threatening cloud), I was quite happy to sit and enjoy the view. I was on holiday, after all. The consensus was that it was usually busier, and would be so the following week, a Bank Holiday if the weather was kind. I enjoyed an early lunch at the Centre’s restaurant. It was good to be able to have a jacket potato with salad instead of the standard car boot fare – which I usually avoid – of something and chips! My only gripe was that the cheese filling was mozzarella rather than cheddar, but otherwise it was good. They also have a snazzy timer thing which tells when your food is ready to collect! The ice creams looked mouth-watering too. When I cashed up, I discovered I’d done better than I’d thought. Not brilliantly, but okay. But of course there is more to life and what I’d discovered was a special place with friendly people and wonderful views.